Dynamic Weddings specialise in providing you, our client an elegant, memorable Wedding Ceremony that you have always dreamt of. Dynamic Weddings is the only DJ Company that provides you with the Correct Co-ordinated wedding music during your auspicious occasion. Dynamic Weddings understand the importance of your day. We will give you advice and guidance for every step to insure the smooth running of your ceremony. We use our years of experience to explain how the ceremony will commence, which songs will be played and when and also coordinate the Brides entrance. We offer a wide range of entrance songs, Haar songs and Sindoor song to help you when making those final choices as well as helping with your personal itinerary and much more. Dynamic Weddings music collection is focused on modernising the traditional Gujarati ceremony and rituals conducted by your Hindu Priest. 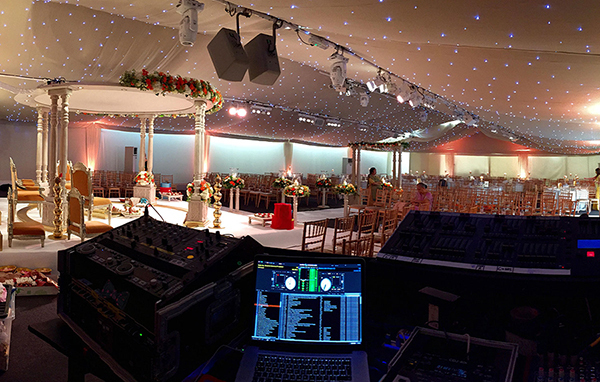 As well as playing the traditional Lagna Geets we also have a large collection of Atmospheric and Bollywood music to coincide with your Hindu Priest keeping your guests focus on the ceremony creating a pin drop silence for your wedding. Working with your Hindu Priest is essential as it enables us to enhance those moments with our music, creating a musical production of your Love Story your guests will remember for years to come. We play traditional songs for each and every aspect of the Hindu wedding ceremony from the arrival of the Groom with the welcoming Pokwanu ceremony to the leaving of the Bride with the Vidai ceremony. Weddings also have a lot of fun elements to it and musically these can be expressed in the form of Gujarati Fatana’s Geets which are happy songs, creating a little friendly competition between the families. With a professional attitude and a great amount of knowledge on wedding ceremonies, Dynamic Weddings will take away all the stress from planning your special day delivering you a beautiful memorable wedding that will be imbedded in your friends and families hearts….